Paolo Bettini of Italy prevailed in Stuttgart, Germany, after a week of polemics that threatened his participation. The 33 year-old from Marina di Bibbona formed part of a five-man group with Frank Schleck (Luxembourg), Cadel Evans (Australia), Alexandr Kolobnev (Russia) and home rider Stefan Schumacher. It stayed clear following the advantage gained over the Birkenkopf at 9.2 kilometres remaining. Bettini passed Kolobnev as he led out the sprint, while Schumacher kept powering for third over Schleck and Evans. "It was a difficult week. 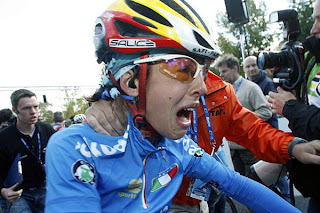 I was accused [of certain things]," said an emotional Bettini at the finish. "This is a present for all the people. It was not an easy victory. Grazie a tutti!" He complimented his nine-man squadra azzurra, "It was a difficult circuit. You can only win with a great team. We had a team that could make the difference." Bettini became the fifth rider to archive the back-to-back Worlds win. His compatriot Gianni Bugno was last rider to double (1991 and 1992); the four other riders that achieved back-to-back championship wins were Belgians Georges Ronsse (1928/1929), Rik Van Steenbergen (1956/1957), and Rik Van Looy (1960/1961). Most of the riders on this year's national team are from the Veneto region: Cunego and Rebellin from Verona province, Pozzato from Vicenza province, Tosatto, Ballan, and Bruseghin from the province of Treviso, and Bertolini from Trento province in the neighboring Trentino region. Marta Bastianelli capped off a dominating performance by the Italian team and won the gold medal ahead of defending champion Marianne Vos (Netherlands). Giorgia Bronzini won the bronze medal and Noemi Cantele (Italy) in fifth completed the brilliant result for the Squadra Azzurra. The attack of the 49 kilo (108 pounds) Bastianelli came right in time and she held off the group of about 15 riders that was chasing behind her. With two Italians in the group they had all options open. "I can't believe it," said the winner with tears in her eyes. "This confirms my results from this year." She explained that her tactic wasn't a planned move. "I had to attack to get away from the strong sprinters in the group. It wasn't planned, it was a spontaneous move. We wanted above all to avoid a sprint with Marianne Vos." "Ora fatemi conoscere Totti. Lui ha vinto il mondiale lo scorso anno qui in Germania, e io l'ho imitato oggi. Il mio sogno ora è andare a Trigoria e incontrarlo" (Now I want to meet Totti. He won the World Cup the last years here in Germany and I imitated him today. It's my dream to go to Trigoria and meet him). 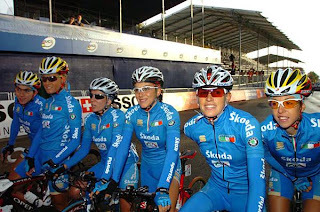 UPDATE November, 2008: Italy's anti-doping tribunal suspended Bastianelli for one-year in October as a result of her positive control for appetite suppressant flenfluramine. She can return to racing August 6, 2009. Since I sliced the back of my leg with the big chainring on Sunday I've been taking time off from the bike to let the wound heal. The rest from the bike feels quite good actually. I guess it was needed and I didn't realize it. Fortunately, the weather here in Verona turned very cool suddenly with lots of rain so it has been a perfect time for some downtime. I welcome some cool temperatures after 6 months of Mediterranean weather, and hardly any rain. There weren't many excuses NOT to ride. The healing has been coming along very well so we'll be riding again tomorrow coincident with beautiful weather returning. The Granfondo Italia is coming up on October 20th so I still have to maintain some reasonable amount of conditioning. After that it's back to some casual rides. While I've been relaxing I've been going to the gym and doing some weight training, and walking around Verona taking photos. The historic center is really lovely. After a glimmering Lake Garda welcomed us on Wednesday's club ride we celebrated Barbara's birthday during lunch. We do have A LOT of fun. After many thousands of KMs in the last two years here in Italy I had my first accident. Returning from the Fiera del Riso raduno I was only two blocks from home when it happened. And, I accomplished it all by myself! I came to a traffic light and unclipped from my left side as I usually do. When I put my left foot down on the ground, for some reason, it slipped on the surface. I started falling towards the left. In trying to get my right foot out of the pedal I pulled back and the chain fell towards the inside and everything went loose. I recovered my balance but my right leg lost the battle against the large chainring, cutting the back of my leg. Chainrings are like razors and the cut was very nasty. Fortunately, I was close to home. Ms. E. did a great job of cleaning the wound, applying medication, and bandaging. Hopefully it will heal quickly. Raduno to "41a Fiera del Riso"
This Sunday's early morning raduno was in the town of Isola della Scala (Verona province) which was holding it's 41st Rice Fair. The fair runs for three weeks, 14 September to 7 October this year. In 2006, 450,000 people attended and 350,000 risottos were cooked! Since the famous "isolana" risotto of this area is featured after the raduno, the ride attracted an extraordinarily large group of 800+ cyclists. So many cyclists made for a slow ride due to narrow roads but the risotto afterwards was, in fact, excellent. We ate in a pavilion that holds 5,000 people...the cyclists were just swallowed up in the immense space. I was told that in the evenings it's difficult to find an available seat! The inner circumfrence of the pavilion is lined with riso and rissoto vendors. There was also a pavilion for music concerts and a very large area of booths selling the local Vialone Nano rice, wine and food produced in the peninsula: cheese, oil, mushrooms, etc. Rice thrives so well in the Po valley that first courses of risotto are more common here than pasta courses and are a great way to serve whatever is in season, from seafood to wild mushrooms (such as Porcini) to meat and game. The tower has a height of 74 meters (243 feet). Upon entering the tower you come to a statue of Victor Emanuele II. A circular, internal, ramp enables you to reach the top of the tower. As you walk up the ramp murals depicting various battle scenes can be seen (see below for details, in Italian, of the murals). La torre di San Martino della Battaglia è un monumento visitabile in tutta la sua altezza tramite una rampa interna circolare che sale di piano in piano mostrando alle pareti affreschi di celebri battaglie: al primo piano il pittore Veronese De Stefani immortala la vittoriosa battaglia di Goito del 30 maggio 1848 quando al grido : "a me le guardie per l’onore di casa Savoia" il Duca Vittorio Emanuele incita la carica dei granatieri di Sardegna; in quell’occasione il Duca rimarrà ferito. Nel successivo piano un affresco del pittore Bressanin evidenzia il combattimento del 27 giugno 1849 a Venezia , al forte Sant’Antonio, dove trovò la morte il colonnello Cesare Rosaroll dell’esercito napoletano. La guerra di Crimea è l’argomento del terzo affresco; è il 16 agosto del 1856 e l’esercito piemontese al comando del generale Alfonso La Marmora vince la battaglia contro i Russi sulle sponde del fiume Cernaia. La mano è quella del pittore Di Stefani. Il quarto affresco è dedicato dal pittore Raffaele Pontremoli all’ultimo vittorioso assalto al colle di San Martino avvenuto il 24 giugno 1859, dopo un temporale e nel quadro, in primo piano sono ritratti il re Vittorio Emanuele II, il generale Mollard e il maggiore Thaon de Revel. Nel quinto affresco: il pittore Vizzotto ritrae la campagna garibaldina dei mille del 19 settembre 1860 nei pressi di Capua dove vi fu un combattimento tra garibaldini e truppe del re di Napoli Francesco II di Borbone. L’episodio del 24 giugno 1866 della terza guerra di indipendenza e relativo alla battaglia di Custoza è dipinto dal pittore Pontremoli nel penultimo affresco e compare il principe Umberto di Savoia che presso Villafranca, dopo aver formato un quadrato del quarto battaglione del quarantanovesimo fanteria resiste alla carica della cavalleria austriaca. Nel settimo e ultimo affresco il pittore Vizzotto ritrae la campagna per la presa di Roma del 20 settembre 1870 quando fu dato l’assalto alle mura di Roma da parte delle truppe del regio esercito italiano al comando del generale Raffaele Cadorna. Viene dipinto l’episodio della morte del maggiore Pagliari presso la Porta Pia dove viene aperta la famosa breccia che, dando Roma all’Italia, coronerà l'opera del Risorgimento italiano. On 24 June 1859, on the hills south of Lake Garda, the Sardinian/Piedmontese army confronted and defeated the Austrians led by General Von Benedek. On the site of the bloody battlefield, not far from Sirmione, a group of monuments were erected to commemorate the victory. Our ride was going to visit the impressive tower, finished in 1893, that is dedicated to King Vittorio Emanuele II (who led the Sardinian/Piedmontese), the battle, and all of the fallen. The "Battle of Solferino and San Martino" was a particularly gruelling one, lasting over nine hours and resulting in over 3,000 Austrian troops killed with 10,807 wounded and 8,638 missing or captured. The Allied armies, under Napoleon III and Victor Emmanuel II also suffered a total of 2,492 killed, 12,512 wounded and 2,922 captured or missing. Reports of wounded and dying soldiers being shot or bayoneted on both sides added to the horror. This battle would have a long-term effect on the future conduct of military actions. Jean-Henri Dunant, who witnessed the battle in person, was motivated by the horrific suffering of wounded soldiers left on the battlefield to begin a campaign that would eventually result in the Geneva Conventions and the establishment of the International Red Cross. The geo-political context for the battle, part of the Second Italian War of Independence, was the nationalist struggle to unify Italy, long divided between France, Austria, Spain, and the Papal States. There is more to Italian riding than just "JRA" (Just Riding Around). It would be easy to get lost in your thoughts as you ride through the very pretty and quite rural wine region of Custoza, across the Mincio River, and passing small towns. Here there are always very interesting history lessons as well, if you desire to learn about them. As we entered the Lombardy Region and Brescia Province we arrived at San Martino della Battaglia. 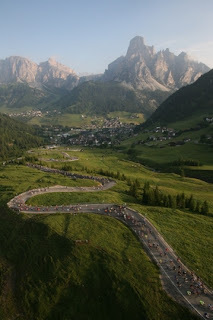 The first announcement regarding the 2008 Maratona dles Dolomites has been issued. If you have thought about coming to Italy to do some cycling a ride in the Maratona dles Dolomites should be right at the top of your list in my opinion. Fostüs....traces!...here is the topic for Maratona dles Dolomites. All of us leave traces. Some are cancelled, others, the real ones, will be admired. The Maratona will leave traces. You, us, we are all working on that together. "Bëgnodüs to the 2008 Maratona!" Bëgnodüs to a green silence. We will deal with reforestation in Ecuador together with the OGM, Operation Mato Grosso. Green life had given way to desolation. With our small traces of goodwill and our efforts, we would like to support reforestation. Nature. A piece of ourselves. It will also be possible to book holiday packages for the next edition. Such offers include the subscription fee, accommodationin structures of various categories beginning from a period of 4 days, along with various benefits for participants. who accompany them. All packages are proposed by the official tour-operator of the Maratona dles Dolomites "Holimites"http://www.holimites.com/. - 28th November 2007: on-line availability of 150 starting numbers whose surcharge will be assigned to charitable institutions. - 28th March 2008: on-line availability of 150 starting numbers whose surcharge will be assigned to charitable institutions. - 18th April 2008: last day for confirming the participation to the race in July and for paying the balance. "The descent into Avio was an incredibly beautiful, somewhat technical, 22 km. The views were spectacular; I'll have to ride up there again some time with my camera. On the descent I was passed by a number of ambulances which always gives me the chills. I passed two down riders that looked seriously injured. A reminder that you always have to be very careful on descents on these small roads." Today I learned that one of those riders that crashed is a friend of mine. "Petra" is an excellent rider, usually placing on the podium and sometimes winning 1st overall in the women's category, as in the Granfondo Eddy Merckx. How the accident happened was really strange. Apparently, an ambulance was driving up from Avio, counter to the flow of the race, in order to reach the first rider that had crashed on the descent. Petra in the mean time was descending. The ambulance, being driven without its sirens or flashing lights, took Petra down near a switchback. Petra has what I gather is something similar to a separated shoulder. She's presently in a cast and after 20 days there will be a determination if the problem will heal itself or if surgery will be required. Itching for a new bike! Did you ever wake up one day and say, "I need a new bike!"? I woke up like that today. The only problem is that the Euro is so strong against the dollar. How bad is it? 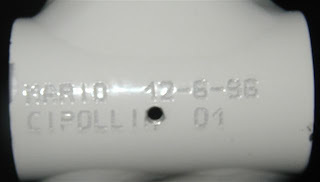 The rate today is 1 EUR = 1.38866 USD which means a 3,000 Euro bike would cost $4,165.97 !! Wow, that hurts. And, as I write this the USA Fed has just dropped interest rates which means the Euro will be even stronger. Since all my friends are sending me a lot of money (ha ha) I decided to spend the day looking at some new bikes at shops and trying to figure out what to do. I mainly would like to replace my "every day and abuse" bike, the Pinarello Marvel alu/carbon that I've been using for 5 years. Just for a change, mainly. Today I looked at the new 2008Wilier "Izoard" (very nice in white, black with blue highlights), and the Kuota "Kebel" (in white and black). Both are, of course, full carbon. I am also looking at a Chesini custom Ti bike (Chesini is the oldest bike shop in Verona, founded in 1925). The project that I also need to do is my "lightweight" project bike built around a Cannondale frame made for Mario Cipollini. I brought this frame with me from the USA and have been collecting lightweight parts here and there trying to cut costs. Really, what could be cooler than riding around in Italy on that with full Campagnolo Record? The frame is a unique white with gold flashing so it would not be my everyday and abuse bike. Sometimes I take FOREVER to make a decision. Like the time I was buying some hi-fi speakers. I went to every hi-fi showroom in the NYC metro area for THREE years. Well, I did finally buy some great Bose speakers, which I still have 15 years later. If the exchange rate doesn't change I'm going to be loving my Pinarello for a long time. It was a hard day, and I retired. Bummer. It is the first time I have not finished a race. In retrospect I made some mistakes and there were factors I couldn't control that caused havoc with my ride strategy. I felt very good in the morning and rolled into the starting grid for the "red", long course (183 Km) at 7:30a.m. The start was scheduled for 8:00 a.m. Ms. E. was very gracious in getting up early to take some photos. The race organizers announced a change from previous years: there would be 15 minute breaks between the starts of each course; long would start at 8:00, medium at 8:15 and short at 8:30. The big implication of this for me was that if I were dropped no group would be coming by for at least another 15 minutes. A very loud cannon announced the race start. The long course attracts the strongest riders so we are off like rocket ships. I was at the back of the red grid. Mistake number 1: the back of a grid is not a good place to be, I was jettisoned off the back immediately. I worked hard to get back into the main group but was making minimal progress. Not how I wanted to start. Fortunately, the group had to slow down about 1 km from the start due to some cars that had gotten onto the road. If was enough of a delay for me to latch back on. From then on I was flying at 55 km/h for 20 km; I love riding in fast groups. I was feeling good, going harder than I wanted but I thought it was better than riding by myself. 20km into the race the red course group was still "gruppo compacto". After passing Ponton there is a slight pitch that bites and I went off the back again. Here I found myself with a smaller group and we all worked together to arrive at the Spiazzi climb. The sign announced that it was 12 km long, 6-7% if I recall the indications on the signage. About half way up I was caught by the leaders of the medium course that started after me. At this point things were still going well. I arrived at Spiazzi and now I was onto roads that were new for me. Mistake number 2: Underestimating how difficult the following climbs were going to be. From Spiazzi to Novezza was 12.7 km, 9-10% with one very short stretch at 18%. This tired me out a bit, especially since things are moving along at a very un-social ride pace. The "killer" came next: Novezza to Valico Monte Baldo, 2.3 km, where we were literally in the clouds of Monte Baldo. A 19% stretch. My god. I made it to within 10 meters of the top when my right hamstring cramped (last time I had a cramp was at the GF Italia which also had a long, flat, start). I managed the last 10 meters and then rode along a flat section before beginning the descent. First, I put on my windbreaker and rolled up my arm warmers. The descent into Avio was an incredibly beautiful, somewhat technical, 22 km. The views were spectacular; I'll have to ride up there again some time with my camera. On the descent I was passed by a number of ambulances which always gives me the chills. I passed two down riders that looked seriously injured. A reminder that you always have to be very careful on descents on these small roads. On the Peri-Fosse climb I really felt miserable. My right hamstring was cramping, my legs were not interested in turning over, my heart rate was much higher than normal for the amount of effort I was doing, and it was hot with the sun blazing. Five switchbacks later I called it a day. I descended to Peri and rode back to Verona. Even that felt hard although comparatively speaking it's "flat". I was all of cooked, fried and toasted. Arriving back in Verona I went to the post race pasta party at the Arsenale where I met up with Beppe, Daniela, Attilio and Juliana who had more intelligently opted to do the short course. We had a nice lunch and shared stories about our day. Back home I checked my POLAR stats: 4 hr 43 of race time before retiring; average heart rate 152; maximum heart rate: 185; September 16, 2007. Obviously it was a too ambitious undertaking, on this particular day, for me. It's also obvious that I need to do some more training going flat-out fast on the flats to build up the muscles particular to this discipline, it is twice now I've cramped later in a race after an ultra-fast start. Photos: I was at the optimistic at the start; the start area in Piazza Bra with the Arena (Roman coliseum), the cannon goes off and the motorcycles lead out at precisely 8:00 a.m. towards Corsa Porta Nuova. I must have lost my mind. The registration area opened today, Saturday morning, and I changed my registration from the "medio" to the "lungo" course. I feel great, I'm in good shape, I'm not getting any younger, and it's not going to rain tomorrow (it has rained on the last 8 of 9 editions of the race). So, I'm going for it....183 km (113.7 miles) with 3,488 meters (11,443 feet) of climbing. It's sure to be somewhat of a suffer-fest. I did the short course, 97 km, last year in the rain. That was a nasty day with only 900 out of 1700 registrants rolling up to the start line, and only 600 finishers. The Granfondo Avesani is Verona's very own granfondo event. It's capped at 2,000 participants and this year, in order to achieve full registration, they have as a prize a Citreon C1. It's not something I have to worry about winning. Fontana, the Verona bike company that is also a sponsor of the race, had an exhibit of their bikes. I chatted a bit with Luigi Fontana, the owner, about his 2008 models all of which were all carbon. How Small Is A Fiat 500? Very small! By the way, the Pinarello frame is a 56x56cm. Going to lunch after the Wednesday ride is a held fast tradition, and part of that tradition is having lunch at the hidden away restaurant at Boscomantico Airport. Here we always enjoy excellent, everything homemade, cooking. In the United States my club had every Wednesday evening rides. My club here also rides on Wednesdays but in the morning. Being a 9:00 a.m. ride that limits who can participate (retirees, self-employed, etc.) so we have a very consistent, fun loving, sub-group. These rides tend to be more relaxed than weekend rides and usually include a visit to Lake Garda. This past Wednesday was a gorgeous day so we lingered for a long time taking in the beauty of the lake and enjoying the sunshine. Borgo di Grazzano Visconti is a medieval village dating back to 1114. The history of Grazzano Visconti is long and complicated. Today, it has approximately 170 residents and receives hundreds of visitors daily. It's a wonderful village to explore in, visit small arts and crafts shops, and have a local specialty for lunch. My favorite was a dessert, torta di fichi (fig cake). Hmmmm.